The weekend is here, and perhaps some of you may have more time available to enjoy preparing a meal. Though we have to admit this recipe takes time, we also know that you will show off with this recipe. The result is a creamy and heart warming meal. 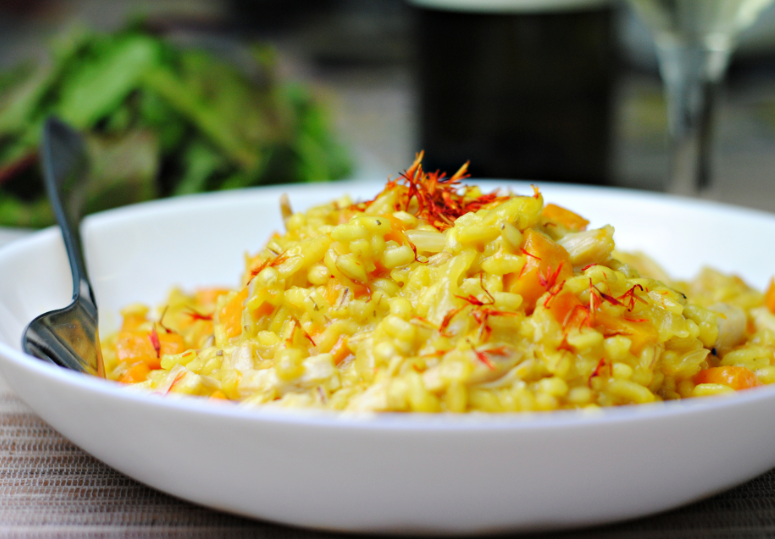 This recipe has two stages: cooking the squash and making the risotto. Some recipes use squash purée, but we prefer having little chunks of squash. You could also substitute the chicken stock for vegetable stock. Notice that we didn’t put salt in the list, as the stock already provides enough salt. You may serve it as a main dish, accompanied by a fresh salad, or as a side for protein. Cooking the squash: Cut off the top and bottom of the squash. Peel of the skin, either with a knife or a potato peeler, until you reveal the bright orange flesh. Cut in half, and cut open lengthwise. Discard the seeds. Dice. Place a pan over medium heat, melt 2 tbsp butter, throw in the squash, keep tossing and cooking until tender, remove it to a medium bowl and set aside. Making the risotto: Heat the chicken stock in a pot, bring to a boil and turn off. In the same pan in which you cooked the squash, melt the other 2 tbsp butter, throw in the chopped onion and minced garlic. Cook and stir until crystallized. Add the rice and cook for about 2 minutes. Pour the wine and stir until it is absorbed. Reduce the heat to medium-low. Pour 1 cup of chicken stock and stir gently and constantly, when it is absorbed, add another cup and so on. The key to having a tender risotto is the liquid, that is why we use a liter. By stirring constantly, the starch molecules are released into the liquid and create a creamy texture. Check the texture, it should be tender, but slightly firm in the center. If it is still hard, then it requires more liquid, if you have used all the broth, you may add some boiling water. Stir in the squash, pour the cream, sprinkle the nutmeg and mix, taste and adjust salt and pepper if necessary. Serve. If you wish, you could add 1 teaspoon saffron threads, parmesan shavings, sage leaves, arugula or it also tastes perfectly fine alone. Source: adapted from The Pioneer Woman Cooks. Categories: Recipes, Squash | Tags: main course, risotto, side dish | Permalink.